Sand systems are usually off-line. A typical sand filtration system is comprised of an inlet structure with a presetting basin, a flow disperser, filtration media, an underdrain system, and a basin liner (Figure 9.23.2). For piped storm water systems, the inlet structure might be a manhole using a weir to divert low flows into the filtration system. 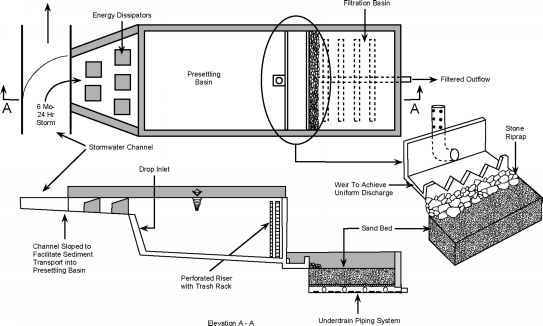 For open-channel conveyance systems, the inlet might be a weir constructed within the flow path to divert low flows to the filtration system, while allowing higher flows to bypass the filtration system. 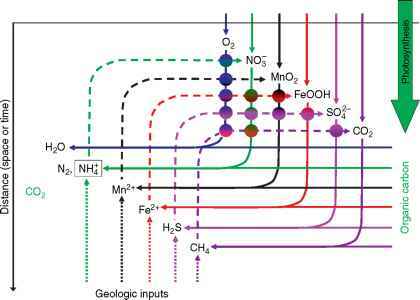 Without a presettling basin, the filter medium may quickly become plugged with large sediments. This basin may not be necessary, if the sand filtration basin is used in place of an API oil/water separator, and if the contributing drainage area is small and completely impervious. The primary pollutant removal mechanisms are filtration and sedimentation. Particulate matter such as sediments, oils and greases, and trace metals are removed by filtration as stormwater percolates through the sand filter. Sedimentation removes large particles, and filtration removes silt and clay-size particles. Over time, sediment eventually penetrates the filter media surface, requiring replacement of the filter media. Maintenance requirements can be intensive, depending upon sediment concentrations in surface runoff. Fifty acres is recommended as the maximum contributing drainage area for a sand filtration system (Schueler, Kumble and Heraty 1992). Peat-sand filters provide high phosphorous, BAD, nitrogen and silt removal. Peat has a high removal affinity for adsorbing and removing toxic compounds (Novotny 1994), hence peat-containing filters are effective for removing priority pollutants.